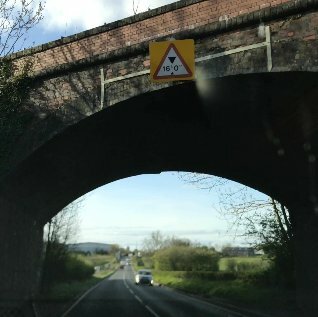 When giving a height restriction for a bridge over a road should the restriction be placed on a short stretch of road under the bridge or for the whole of the relevant highway giving notice well in advance. I would only tag the short section of road under the bridge with the maxheight tag. Routers should be able to then avoid the bridge (if they know your vehicle height). Tagging the whole way isn't necessary, and risks any side roads that aren't affected by the height restriction becoming unroutable. maxheight is primarily a legal restriction (unlike maxheight:physical) and if there are signs, then you should tag the entire stretch of road between the relevant traffic signs with maxheight. @Tordanik, in the United States, the maximum-height restriction only applies to the actual point of physical restriction, though you will often see warning signs well ahead of that point. For something passing over the road, I generally tag the shortest length of road for which passing the obstacle in question is unavoidable. For a tunnel, I put the tag on the way representing the tunnel itself. Thank you for the information, @Carnildo, I was not aware of that. @EdLoach's answer still isn't correct for parts of the world where things are handled differently, though. As it's currently the accepted answer, it should ideally be applicable globally, and I would be happy if it was amended to explain the distinction. Yes, clearly tag the part where the official restriction is applying to. I found it useful to additionally mark the signs (traffic_sign=maxheight, maxheight=xy) on a node besides the road (to see which direction it applies to) as a hint for other mappers and to store the position more permanently (highway-nodes tend to get moved by the time).